Before he was known as one of the Four Champions of Rubrum, Kurasame was nothing more than an ordinary trainee striving to make it to the top class of Agito Cadets. However, after a class outing goes terribly awry, Kurasame is put on the path that will eventually see him become the famed “Ice Reaper” in this prequel to Square Enix’s Final Fantasy Type-0. As a cadet of Akademia’s Class Three of Agito Cadets, Kurasame never felt as though he truly fit in with his classmates. Pining to join the prestigious Class One, Kurasame had always looked down on his classmates but slowly resolved to change this outlook shortly before his class embarks on a “guts challenge”. However, something sinister lies in the wait for the cadets and the subsequent disaster changes Kurasame as he is forced to come to terms with the deaths of so many of his comrades. While all memory of the cadets who died wiped from the surviving, Kurasame and his remaining friends must come to terms with the lingering pain of this loss and find a way to avenge their classmates. If you enjoy a solid action series with some drama, this series will be right up your alley. However, those who have already played Final Fantasy Type-0 and are familiar with that world will enjoy this series the most. Final Fantasy Type-0 Side Story: The Ice Reaper Vol. 1 is a serviceable action series which benefits from a compelling premise as a coming of age story for Kurasame. The very beginning of the volume takes place years into the future, showing Kurasame as the calm and collected commander of Final Fantasy Type-0’s Class Zero before jumping back in time to his high school days at Akademia. It would be stretch to call Final Fantasy Type-0’s premise and mythology anything close to approachable, but Ice Reaper Vol. 1 does a fine job avoiding over-complication by focusing singularly on Kurasame within the context of Akademia. I felt this was an effective decision that avoided overburdening readers early on with a dense mythology and made this volume as approachable an introduction to this world as possible which I really appreciated. While those who played Type-0 first will still get the most out of this series, those looking for an introduction to this world will be satisfied here and won’t have too much difficulty following this series. I particularly appreciate the way that author Takatoshi Shiozawa managed establish his characters in tandem with conveying the working of Type-0’s world, as Kurasame and his classmate are effectively characterized in the first couple chapters. This made me feel invested in their struggle once things go south for them in a massive way and I felt that Kurasame’s character development felt appropriately weighty given his ordeal in this volume. While it struck me as somewhat convenient how quickly he came to certain realizations about his own nature, it still felt gratifying to see his development throughout the volume. I also felt this contributed to this volume’s pacing as allowing Kurasame to grow quickly prevented the story from beginning to drag and kept a great sense of forward progression throughout. Shiozawa’s art is a further positive aspect of this book as he is able to give this volume’s action scenes a strong sense of style. Kurasame is portrayed as a proficient and flashy fighter, and Shiozawa is able to use larger panels to give Kurasame a distinct stylish flair which really can only be described as just plain cool. This effect stands in strong contrast to the horror with which other scenes are portrayed, and I enjoyed how Shiozawa was able to give other scenes an appropriately unsettling feel. The scene where Kurasame finds numerous dead cadets stands out because of this aesthetic, enhancing the emotional punch of this scene effectively. While Type-0’s world is effectively established, Ice Reaper Vol. 1 doesn’t manage to avoid some of the more ineffective parts of this mythology. This is most apparent from the way memory erasure is incorporated in the story, leading to some moments that feels plot holes. Those who remain living lose all memories of the dead, and while this concept in itself is quite interesting, it is explained vaguely and its presence in the story feels inconsistent and illogical. At one point in this volume, one cadet has his beloved die arms and goes from immediately lamenting her dying to losing his memories and unsentimentally finding the body disgusting. This is seemingly contradicted later when the cadets note feeling a profound sense of loss towards the death of all their classmates which they later want to avenge, making it feel odd that this didn’t appear to be present in the previous scene I described. While this could be explained as the sense of loss being able to be felt on an individual level, this is just glossed over and like a couple of other instances like this is never properly explained. Overall it feels like the concept is too vaguely explained to work well within this series, making it difficult to really stay engaged with this facet of the cadets’ emotional trauma. Ice Reaper Vol. 1 works relatively well when it maintains a serious tone that feels appropriate to the type of tragedy the cadets are faced with in this volume. However, there is a rather jarring tonal shift as there are a few comedy scenes in the final chapter of the volume. While it certainly doesn’t help that the jokes here fall completely flat, the main problem is that these take place directly after the Class Three’s massacre during which the surviving cadets are shown in serious mourning. This seriously clashes with the tragic tone the had carried through most of this volume and generally felt unnecessary. This was also amplified because the tone become serious again directly afterwards, making this an unfortunate break in the tonal progression shown in this volume. 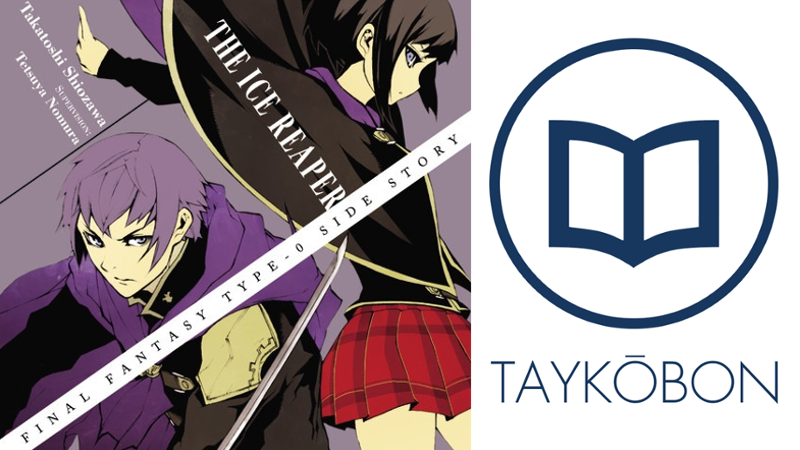 Ice Reaper Vol.1 manages to tell a more cohesive story than the video game it is spun-off from thanks to the meaningful characterization and a stronger sense of focus as the story of one relatable protagonist. It thankfully avoids burying readers in dense mythology and manages to ease readers into its world effectively, and stands alone effectively as its own series. Combined with the sense of style displayed in action scenes, I can still recommend Ice Reaper as a worthy action series that those returning and new to this world will find enjoyable despite some unfortunate tonal problems and plot inconsistencies. Final Fantasy Type-0 Side Story: The Ice Reaper Vol. 1 was published by Yen Press on July 21st, 2015. Authored by Takatoshi Shiozawa and supervised by Tetsuya Nomura, the series is a prequel to Square Enix’s Final Fantasty Type-0 video game. The series began serialization in 2012 in Square Enix’s Shonen Gangan magazine, with the series being completed with four volumes released and volume 2 will be published in English on October 27th, 2015.